The role of real estate in our cities is crucial to building sustainable and resilient urban futures. Smart Urban Regeneration brings together institutional, planning and real estate insights into an innovative regeneration framework for academics, students and property professionals. Starting by identifying key urban issues within the historical urban and planning backdrop, the book goes on to explore future visions, the role of institutions and key mechanisms for smart urban regeneration. Throughout the book, international case studies and discussion questions help to draw out global implications for urban stakeholders. Real estate professionals face a real challenge to build visionary developments which resonate locally yet mitigate climate change and curb sprawl, and foster biodiversity. By avoiding the dangers of speculative excess on one side and complacency on the other, Smart Urban Regeneration shows how transformation aspirations can be achieved sustainably. 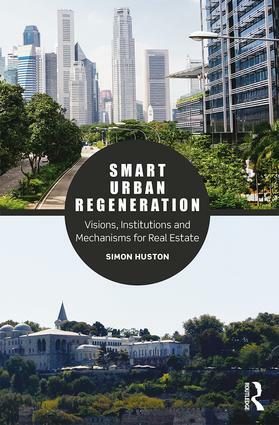 Academics, students and professionals who are involved in real estate, urban planning, property investment, community development and sustainability will find this book an essential guide to smart urban regeneration investment. Simon Huston is a Senior Lecturer at the Royal Agricultural University, UK.